My two boys love all things dinosaur, so when I heard about the Dinosaur Projection Alarm Clock, I knew we had to review it. This awesome stegosaur is perfect for my older son (he is 9) because we are starting to try and have him take more responsibility and wake up on his own and start getting ready for school. This clock matches his decked out dinosaur room so well and the prejector images are so cool and add such a neat touch to the clock. This makes a dino-mite clock for kids who are fans of the stegosaurus and his mighty friends. Kids will enjoy the 4 prehistoric images as well as the digital time projected above their heads. All of my sons friends love this clock when they come over, and love the projection, especially because my son also has glow in the dark stars in his room. The two of those together really makes it feel like they have stepped back in time! 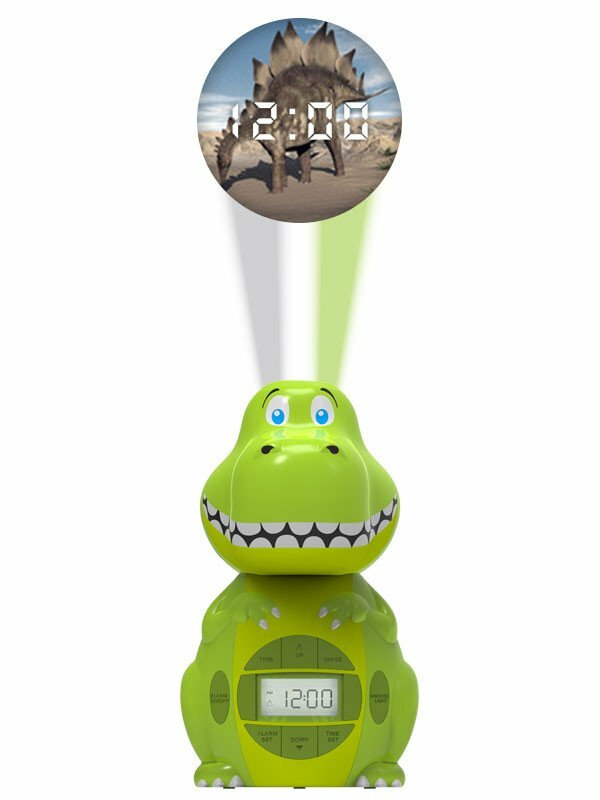 The Dinosaur Projection Clock is great for kids around the age of my son, who are getting a luttle older, and taking more responsibility, but still small enough to enjoy toys and the quirkier things in life. At only $30 it is perfect holiday gift for the little Dino lover in your life. If your little one is not into dinosaurs though, this clock comes in a cat and dog version as well!! Win It: One lucky winner will get to pick a Dinosaur, Cat or Dog Clock. My favorite feature is that it projects the time and 4 different dinosaur images on your ceiling! I love that it has an optional timer on it, which is really great to have. I like that the timer can be for 10 or 30 minutes. I like that the time and 4 different images are projected on the ceiling. I like that its Head rotates 340 degrees! I like that it projects time and 4 dinosaur images.